Nuala Ní Chonchúir was born in Dublin, and lives in East Galway. She has published four short story collections, the most recent Mother America appeared from New Island in 2012. Nuala’s critically acclaimed second novel The Closet of Savage Mementos appeared in 2014, also from New Island; it was shortlisted for the Kerry Irish Novel of the Year Award 2015. 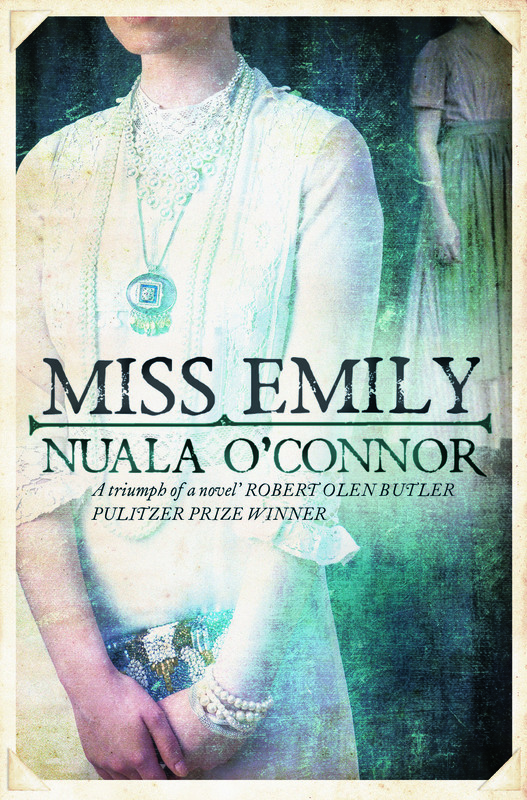 Under the name Nuala O’Connor, Penguin USA, Penguin Canada and Sandstone (UK) published Nuala’s third novel, Miss Emily, about the poet Emily Dickinson and her Irish maid, in summer 2015. Congratulations on the success on Miss Emily, Nuala. You must have done a huge amount of research for this book, can you tell us about that? I read about thirty books of research by and about Emily: poems, letters, biographies, books on food and dress pertaining to the Dickinsons. I did the research as I wrote. When I had a first draft written, I visited Emily’s home in Amherst, Massachusetts; I saw her white dress on display in the Amherst History Museum and I went to Harvard University, which holds many Dickinson artefacts, including Emily’s original cherrywood desk. The research is ongoing – she gets hold of you! And what drew you to the subject of Emily in the first place? Poetry and cake. I loved her poetry at school and, later, I heard she loved to bake. I love baking too so I made some of her cakes (Coconut Cake and Black Cake, for example). I wrote a poem about that but couldn’t let the subject go and began to think of the Irish domestics she had and the whole thing just blossomed from there. Back to the beginning, Nuala – to when you first began writing? I’ve been writing since I was a little kid, I still have my first notebook of poems. Naturally, they are appalling and sentimental. Subjects range from a blind sister (all my sisters have their sight) to James Dean. But I didn’t get serious about my writing until my mid twenties when I moved from Dublin to Galway to work in a theatre company. Meeting real live writers helped me push myself along. And how long were you writing before you were published for the first time? I was serious about it for about a year, I suppose, when I had some poems published in literary mags in Galway, such as The Cúirt Journal and Burning Bush. My first collection of poems came out in 2003 – there was about six years worth of stuff to draw on for that. I write five days a week, 9am to 2pm, pretty much. I don’t write creatively for all that time: I write first, then edit or write articles/interviews, do my mentoring work with the BA in Writing students at NUI Galway, write reviews etc. The first draft of a novel takes about a year, then the editing with agent and various editors might go on for another year (depending on the publisher’s schedule). Short story collections are different as you gather stories over a period of years. Do you think an agent is necessary? You need an agent if you want to be published outside of Ireland, but you don’t if you plan to publish in Ireland alone. I am on agent number three now and I hope she is the lifer. It took me a while to find the right agent for me, one who I could communicate openly and freely with and who is definitely prepared to work hard on my behalf. And on marketing and PR of your work, do you contribute? Yes, hugely. My novel Miss Emily has just been published by Penguin – my first time with a really big publisher – in the USA and Canada. Naively I thought I would have less PR stuff to do as they would do so much. Wrong! I have never been as busy on the PR side of things: they have drummed up huge amounts of notice for the book so I have 3 or 4 radio interviews a week with North America; I’m writing article after article on subjects pertaining to the book or directly about it; I have a book tour in the USA; I was in Scotland yesterday for a newspaper interview and I’ve lots of appearances in Ireland at lit fests and so forth. And the same novel comes out in the UK in late August so I am now on the PR whirl for that too. I am lucky in that I enjoy social media so it is not a trial for me to keep blogging and tweeting about the book and all that’s happening. It’s like this, you spend two years writing and editing a book, the least you can do is support it out into the world by doing PR stuff for a few months. Yes, it’s time consuming and it wears you out a bit but, hopefully, it will be worth it in terms of readership and sales. What is your opinion on the importance [or not] of literary competitions and awards? I guess they shine a spotlight on books that is welcome if your book is on the shortlist! But you cannot compare like with like, so it’s the personal taste and the group dynamic of the judging panel that determines the winner. It would certainly be nice to win one of the biggies as it would get you a wider readership and welcome sales. But prizes shouldn’t be the be-all and end-all of judgement on the merits of literature. Read like a loon – voraciously, widely. Write every day. Join a writers’ group. Go to literary festivals. Be friendly. Probably hundreds. But there’s certainly a short story I read recently that I wish I had written: Joyce Carol Oates’s ‘EDickinsonRepliLuxe’ about a couple who buy an Emily Dickinson robot and the madness that ensues. It’s poignant and weird – true Oatsian shenanigans ensue between the couple and the robot. I wish I had come up with that story, so badly. And finally, Nuala, can you share with us what you are working on now? A Victorian novel set in London and Ballinasloe (where I live), based on the true life of the local Viscount and his dancehall girl bride. This entry was posted in Writers in Ireland Series and tagged Emily Dickinson, Irish Writers, Nuala O'Connor.